Junior sailors Robert and Matthew Crawford (AUS) won the Open Pre-Worlds practice regatta after two wins in the only races sailed on the final day. Second were Paul Snow-Hansen/Jason Saunders (NZL) and third were Jo Aleh/Olivia Powrie (NZL). 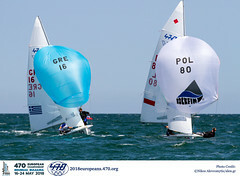 Held from 22-23 January, the Pre-Worlds regatta was a warm up for the 2012 470 Junior World Championships being held from 26 January-3 February. 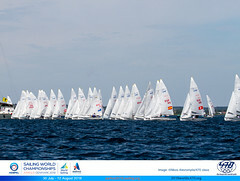 Day two of racing began slowly with overcast conditions, rain and no wind. However after a wait onshore, the breeze filled in and allowed the race committee to get two of three races away before time was up. The offshore breeze varied a great deal in strength and direction as is typical of this WSW direction. Day one of racing was sailed in a very difficult south south-west offshore breeze which was shifting constantly, the sun was shining and the water flat. Twenty boats contested the Pre-Worlds, including two senior teams who are will be representing New Zealand at the 2012 Olympics – and were keen for a bit of practice. Paul Snow Hansen/Jason Saunders finished eighth in the 470 Men event at the ISAF Worlds in Perth back in December, whilst a bronze medal was awarded to Jo Aleh/Olivia Powrie in the 470 women event. Whilst glory was theirs in Perth and they will be on the Olympic startline, it was Australia’s Crawford brothers who set the pace in Takapuna. 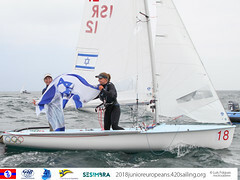 Sailors now have a few more days to prepare before registration and measurement takes place and the fun at the 2012 470 Junior World Championships begins.